More than 9 million children visit Emergency Departments in the United States each year. Nationwide and at NorthBay Medical Center, the No. 1 reason is the same—fever, says Dr. Seth Kaufman, pediatric director for the Emergency Department. While worrisome for parents, most fevers are just a sign that your child is fighting off an infection. The American Academy of Pediatrics advises parents to make the feverish child comfortable, rather than focus on bringing the temperature down to normal. Fever becomes an emergency when it rises to 100.4° in babies under 3 months old or is higher than 102.2° for more than 24 hours in children under age 2 and more than 72 hours in children age 2 and older. Abdominal pain in children can have many causes, from constipation and urinary tract infections, to milk allergies and even emotional upsets. Abdominal pain is an emergency if it is a symptom of appendicitis. Rare in children under age 5, the first sign of appendicitis is a complaint of constant stomachache in the center of the abdomen, and later the pain moves down and over to the right side. Because many common childhood illnesses can cause vomiting, you should expect your child to have this problem several times. Usually it ends quickly without treatment. Persistant vomiting becomes an emergency when it causes dehydration, when it happens after the child has hit his head, or if the child is throwing up greenish fluid, blood or what looks like coffee grounds (blood mixed with stomach acids). According to the Centers for Disease Control, injuries are the No. 1 cause of death among children in the United States. In Solano County, accidents caused by falls account for the most injuries among children who visit the emergency department, followed by motor vehicle accidents. 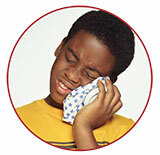 Call 9-1-1 if you suspect an injured child needs help. Most skin rashes are not dangerous. 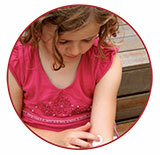 They can be caused by allergies such as hives or poison oak or by viruses such as measles. A skin rash becomes an emergency if your tot breaks out in one and has trouble breathing at the same time. Another emergency: your child develops petechiae, flat purplish dots caused by broken blood vessels that are usually a sign of a serious infection or bleeding problem.